–Asobi Seksu’s new album Rewolf will come out November 10 via Polyvinyl records. The album was one of the last recorded at the legendary Olympic Studios. Pre-order is available here. -Muon has 4 new live tracks for free here. They are currently writing their new studio album. -Cornelius is producing original music for Scott Pilgrim vs. The World. –Absolute Polysics will be available on iTunes September 29. –Freaky Frog is putting out their debut album on November 4 in Japan. The band is fronted by former BEAT CRUSADER umu. –Overground Acoustic Underground has a trailer for their new album. -BoA’s US album was released again. –Maru Music will put out An Cafe’s new album BB Parallel World on October 20. It will include a DVD with four music videos and a live clip. -Dir en grey will be in North America this November. FACT will be touring with Senses Fail this October. BANK is an acoustic/jazz band from Too Young Records. 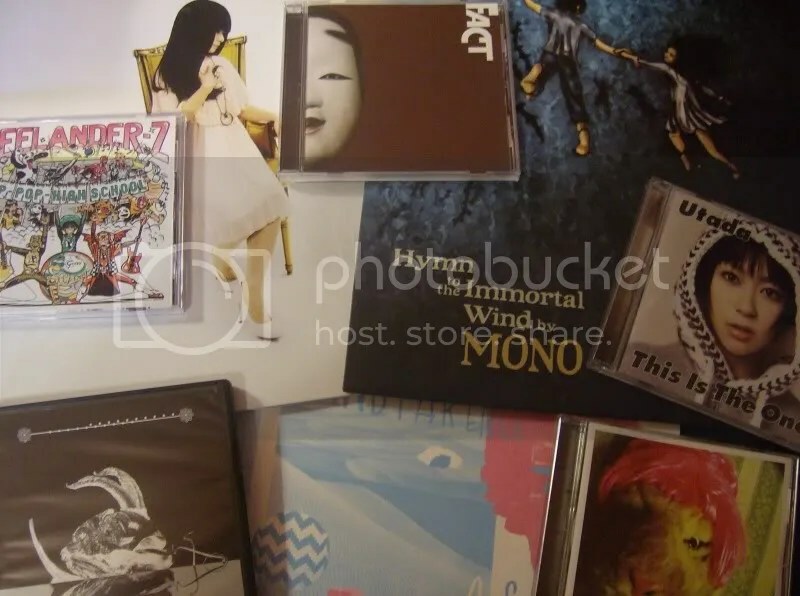 On this blog, I like to talk about what Japanese albums are getting a US release. So, I’d like to introduce a page I’ve been working on since the beginning of this year, the 2009 US Release Calender. It’s been live all this time, but considering it has only gotten 39 views so far, I have to assume no one knows it exists. It’s a very simple list of what came out this year, followed by a link to where to buy it and their myspace if applicable. I only include albums that were released on CD or vinyl. MP3 downloads are too numerous and really take no effort to release. I like physical media. It gives me a sense of ownership that MP3s will never, ever have. I also have 9dw’s self titled LP. It came moments ago, that’s why it’s not in the picture. There’s also a couple other things I have on order. Right now, albums I’m most looking forward to later this year are Armonica Hewa by OOIOO, Rewolf by Asobi Seksu, and Dir en grey’s music video collection. I also have to applaud Maru Music for getting their releases on Hot Topic shelves. I was able to buy Versailles’ debut album from there a few months ago. I’m constantly updating this page, I added three releases yesterday alone, so be sure to bookmark it. Also, be on the lookout for a This Month In J-Rock announcement next week. Why hello there. I have nothing witty to say this week. I’ve just been listening to a lot of Japanese music and attempting to job hunt. It’s been quiet around the house since my sister went back to school, so I’ve been able to “restart” my other two blogs. And here we are with this week’s assortment of Japanese music videos. And now this column has officially outlived the former J-Rock Fridays haha. Personal triumph, I guess. Next time I’m going to try something a little different. Or if that doesn’t work out, more random videos. Whatever. Bye. Last week, Andrew W.K. 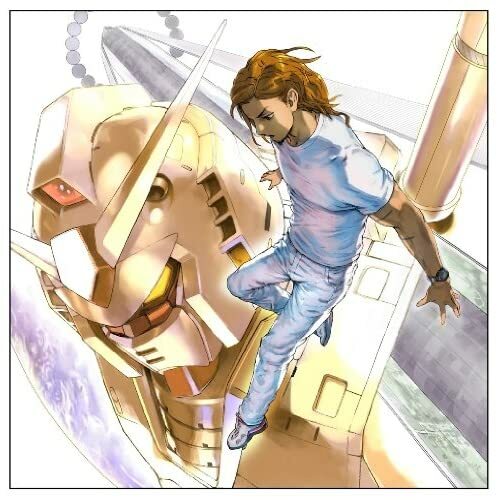 released his brand new album Gundam Rock, a cover album full of songs from the original Gundam anime. Now I know what you’re going to say, why is a gaijin recording Gundam covers? Although I consider I Get Wet a classic, Andrew W.K. faded into obscurity after his second album was released in America. But for whatever reason, he blew up in Japan. They love him there. It’s mind-boggling. Flash forward to 2009 and Andrew’s back in the spotlight as Cartoon Network’s “CN Real” poster child. But he didn’t forget Japan. And this is when Andrew was invited to record a cover for Gundam’s 30th Anniversary Tribute Album. But he decided not to stop at one cover and here we today with Gundam Rock. I’m sorry Eric Bresler, I didn’t want to give Dir en grey their own post. Think of it this way, any post that mentions Dir en grey gets 10x more views. -The End Records will release a DVD collection of Dir en grey music videos called Average Blasphemy on October 27, 2009. The videos included come from the Marrow of a Bone and Uroboros albums. Making-of footage and alternative cuts will be included. -Tokyo No Records will release the heiz’s first album this fall followed by a US tour October-December. The Questionmarks- Boo! I’m A Ghost! -As reported last month, Tokyo No Records will release The Questionmarks debut American album on November 3, 2009. A US tour will follow in 2010. 2. Boo! I’m a Ghost! All three releases have been added to the 2009 US Release Calender. Dutifully, here is the second installment of J-Rock Fridays. This week we have two ambient artists from Preco Records, a screamo band, my favorite electronic song ever, and a flamboyant K-Pop artist. For the anime fans: Makota Shinkai (Voices of a Distant Star, 5 Centimeters Per Second) used Satie’s original Gymnopedie 1.0 in his short Other Worlds. All I’m going to say is major LOL. You are currently browsing the J-Rock Explosion blog archives for September, 2009.